For the first time this year, Deutsche Bank Wealth Management was the trophy race sponsor of the Mille Miglia, one of the world’s most prestigious racing events. Founded in 1927 as a speed race, today it sees classic car lovers congregate in northern Italy for the race through some of the most beautiful landscapes in the world. 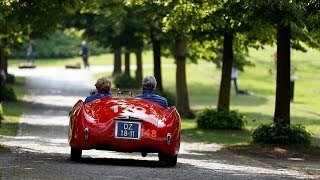 450 classic and vintage cars roared through the Italian countryside in the 91s tedition of the historic car race sponsored for the first time this year by Deutsche Bank Wealth Management. This year’s event attracted 1,450 participants in 725 crews from 44 countries. The Alfa Romeo 6C 1500 GS Testa Fissa crewed by Tonconogy-Ruffini won the race, followed by two more Alfa Romeos in second and third place. “The most beautiful race in the world,” as Enzo Ferrari once called it, has been a leading car race since 1927, won by racing legends such as Giuseppe Campari and Tazio Nuvolari. After a serious accident the race was interrupted in 1957 and eventually restored in 1977 as an event for vintage car enthusiasts from all over the world. “Mille Miglia is a symbol of experience, excellence, tradition and innovation, values it shares with Deutsche Bank Wealth Management,” said Vincenzo Gallimi, Head of Communications & Corporate Social Responsibility at Deutsche Bank Group, Italy. Partnering with Mille Miglia has and will continue to be an exciting opportunity for us to help connect people from across the world through the power of sport. This prestigious race brings people together through their shared passion and shapes unforgettable experiences for everyone involved. The four-day race, which took place on May 16 – 19, started in Brescia, following its historic 1,600km route. From the start-line, participants made their way to San Marino and then on through the heart of hectic Rome. A highlight of the route is the section that cuts through Siena, home to the historic Il Palio horse race, and the surrounding area. The parade of vintage cars driving down roads lined with cypress trees, against the backdrop of the rolling hills of the beautiful Italian countryside captured the essence of what this race all about. The final leg of the route travels north to Parma, finishing back in Brescia. Deutsche Bank Wealth Management is the Trophy Race Sponsor of the Mille Miglia in 2018 and will be the event's Global Lead Partner from 2019 until 2021.